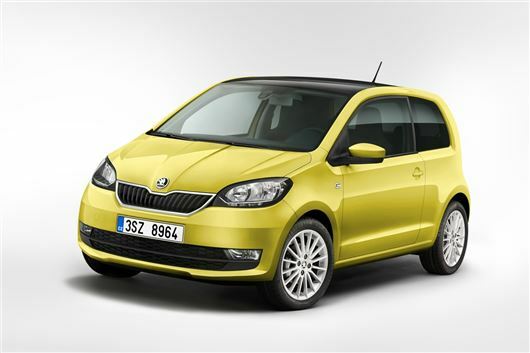 Skoda will show the updated Citigo at this year's Geneva Motor Show. It gets a slightly redesigned front end with a different grille, new 15-inch alloys and a new look for the instrument cluster. Other changes mean SE models now come with tinted rear lights plus a colour package with roof and side mirrors in white or black is available for Colour Edition versions. The engine 'range' continues as before. The 1.0 MPI comes in two versions, a 60PS standard model and the 75PS version, both of which average a claimed 68.9mpg. The headlights are fitted with LED daytime running lights and cornering front foglights are available as an option. The new 15-inch alloys come in silver and anthracite and are available on the SE L trim level plus there's a new Kiwi Green paint colour. These changes mean the little Citigo has grown ever so slightly - although only by 3.5cm but interior space stays the same with a 251-litre boot. The new instrument cluster comes in two different versions and there are new generation Blues and Swing radios - the latter getting a colour display and Bluetooth. The Citigo comes in S, SE, SE L and Monte Carlo trim levels, plus there's the option of the Colour Edition. Great looking little car, better than the VW Up and Seat Mii, but no TSi version of the 1.0 litre engine, as already features in the Up, so that is a huge disappointment. I wish they'd create a VRs version with the 115ps turbo engine supposedly making its way into the long awaited Up GTi next year - but no doubt VW won't allow it. Oh well Mr VW, I won't be buying either then! I would love one of these, but they only have four seats which makes it impractical for me with three grandchildren to carry. It looks wider than many cars that have five seats so why only four VW? The Viva, i10 and Picanto all boast space for five so come on VW at least make one of the trio - up!, Eon and Citigo - a five seater. Surely it's possible.